This amazing photo of a Bald Eagle was taken by Doug Brown of Albuquerque. If you look closely you will see that the eagle is in the third plumage class, just before becoming an adult. While the head and tail are mostly white, there is still some brown mottling. And the underside of the wings shows some white streaks. Bald Eagles have 5 different plumages corresponding with their age. In the first year, the juvenile has a brown head and beak and dark brown eyes.The dark tail may have some white markings and the belly is tawny. Plumage class 1 birds have dark heads, a whitish belly, gray cere and beak, and dark breast. Plumage class 2 birds are similar, but the beak and cere are yellowish, as are the eyes. Plumage class 3, like our bird above, is similar to that of an adult. The head is mostly white, but may have a dark eyeline. The tip of the tail has a black band at the end. The body and wings may have some white spots. Adult plumage occurs at 4 years. 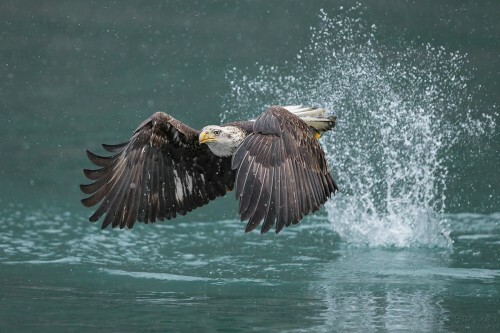 The head and neck of the Bald Eagle projects more than half of the tail length when in flight. The white head and tail and dark brown wings and bodies of the adult Bad Eagle make them easy to identify. Plumage of males and females is the same, but the female tends to be larger. Many thanks to Doug for this incredible photo.